Lia , your naughty monkey is so cut, not scary at all. I have to make a Halloween bento this year. I am so far behind. I do like getting ideas from you! Hi Lia, Seems like long time did not visit you...sorry, been quite busy and tired lately but when I saw your naughty monkey makes me so alert :D So cute!! Ha ha! So funny. Naughty monkey. I have got to get cracking and make some Halloween bento myself. I can't believe I haven't done one yet. Lol! Have him throw one my way! Festive and lighthearted, this was just the bento to look at after a long and rather silly day...what great flavors too--love the combo of honey and five spice powder, inspiring, Lia! hahahhaa..his face expression is certainly a naughty one. haha.. Cheecky Monkey! ya.. will be anticipating your pink ribbon and halloween bentos! Another fine job & so cute. Looking forward on your Pink Ribbon Bento. I have been following your blog and am looking forward to your new bento everyday. May I know how long you take to prepare these bento each day? Looks a lot of art work to me. @Ohayo Bento : Are you sure? hehehe ... Thanks a lot Heather! @Journal Mommy Yenny : You can make one after your business trip. No pressure dear! @EIN : My bento making time is so vary from 30 minutes - 2 hours (including cooking time). I usually cut out the cooking time in the morning, so I just need to decorate the bento in the morning. I cook the meat at night, put in the freezer and re-heat in the morning. Veggies are cut at night, so I just need to stir fry them in the morning. Lia, so sorry to hear about your friend's husband. So young and so tragic. I hope she is okay. Will take so much time to heal. I am thinking of her. 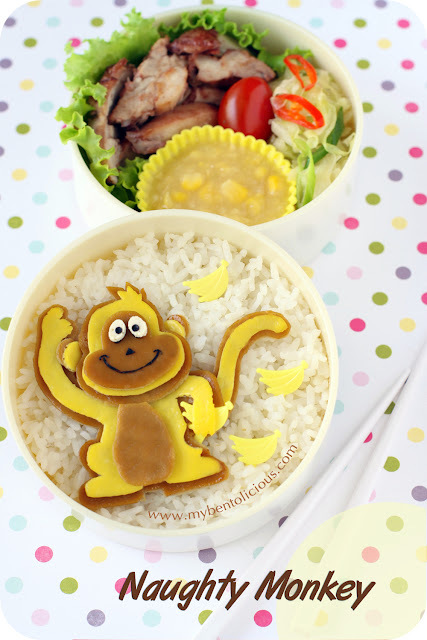 Your bentos are always so fun, so intricate and so imaginative! I love it. I know how busy life can get. I'm trying to catch up as well and failing miserably. Busiest time for my job right now is.. now. lol. Can't wait to see your halloween themed bentos! Hi Lia! I've known you from twitter, but never had a chance to visit your blog till now. Oh my goodness, you make crazy bento!!! I'm so impressed by your talent! I grew up with bento from junior high but my mom wasn't a good bento maker...and so I am. I have 5 year son and 3 year old daughter that I'll need to make bento everyday from next year. Your site will help me inspired to make cute bento box! @ChantaleP : Thanks a lot Chantale! You are one of the sweet and caring friends that I knew. I thought my life will be less busier when the kids are bigger ... apparently not lol :D Please take care of your health even in your busiest days.